Please welcome curator John Zarobell on Images in Dialogue, currently on view. 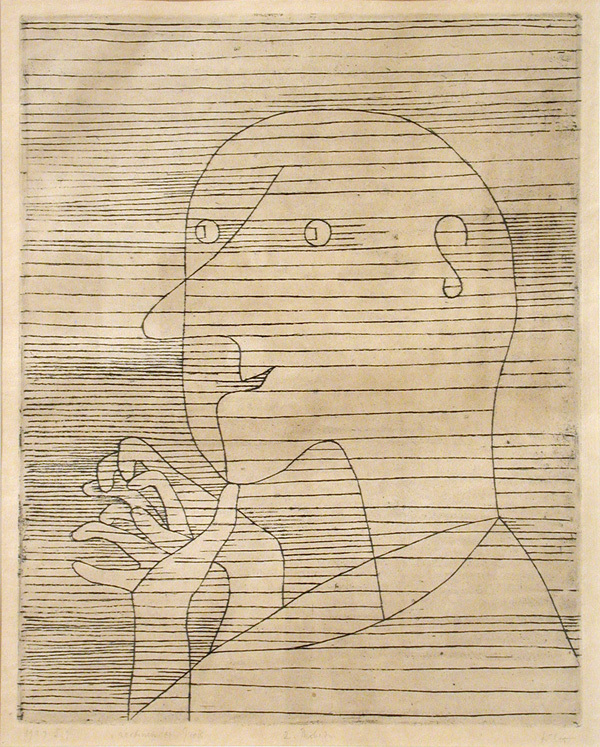 Paul Klee has long been known as an artist’s artist. Though he was a seminal figure in modern art, he has never had the name recognition of a Picasso or Matisse. But he worked prodigiously (the catalogue raisonné of his work is nine volumes), inventing more worlds than you could possibly count. When he started teaching at the Bauhaus in 1921, he turned those worlds inside out, to share the lessons he had learned and to structure experiments for himself and for any artist who might dare to follow him. Like so many figures of his generation, he had been trying to invent a new language for abstract art. But it is one thing to do it and another to show others how to make it work. Since that time, artists have been learning from Klee, and I don’t think the process is slowing down any despite the multifarious changes in the nature of art and artists over the years. When I thought to do a project pairing Klee with a local emerging artist in our Djerassi gallery (where visitors to SFMOMA can always find Klee’s works), the idea was admittedly not original. Six years ago, then-Curatorial Associate Tara McDowell worked with Simon Evans, who selected a show of Klee works from our holdings and added a piece of his own. 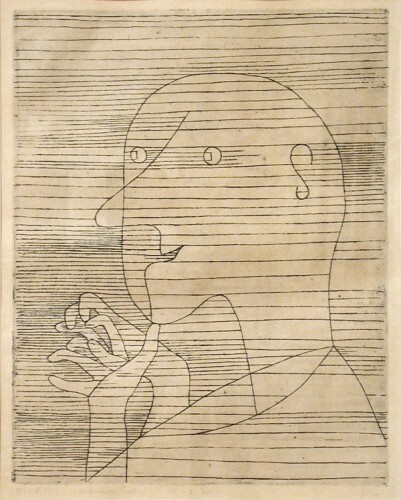 In 2007 Apsara DiQuinzio paired drawings by Klee with those of Devendra Banhart, who had a long-standing fascination with the modern artist. 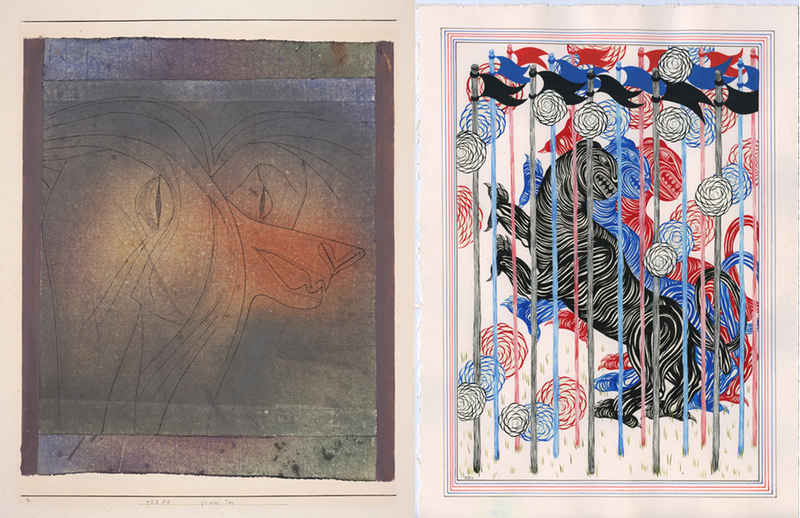 This year I set out to combine Klee’s art with that of Andrew Schoultz, a fantastic draftsman in his own right who has worked in San Francisco for a dozen years and whose subjects — cities, horses, and trees — frequently appear in Klee’s works, as well. It turned out that Andrew was very responsive to the exhibition idea, even though he had not taken any particular inspiration from Klee up to that point. He took on the project with great enthusiasm, and together we looked at every one of the hundred or so Klee works SFMOMA possesses, many more than once, and a bunch of books besides. After sifting carefully through the works and absorbing their methods and symbols, Andrew set to work responding to a group of about 20 of Klee’s drawings, paintings, and prints that had captured his attention. This resulted in about 15 drawings made in four weeks (Andrew is no slouch either), about half of which are featured in the current show. For those who know Andrew’s work, it is clear that with this project he continued to elaborate a handful of subjects and themes for which he is well known, such as broken bridges, war horses, and telephone poles, but he boiled them down to their most essential elements. In some cases, he has made them more visually rich than ever before. 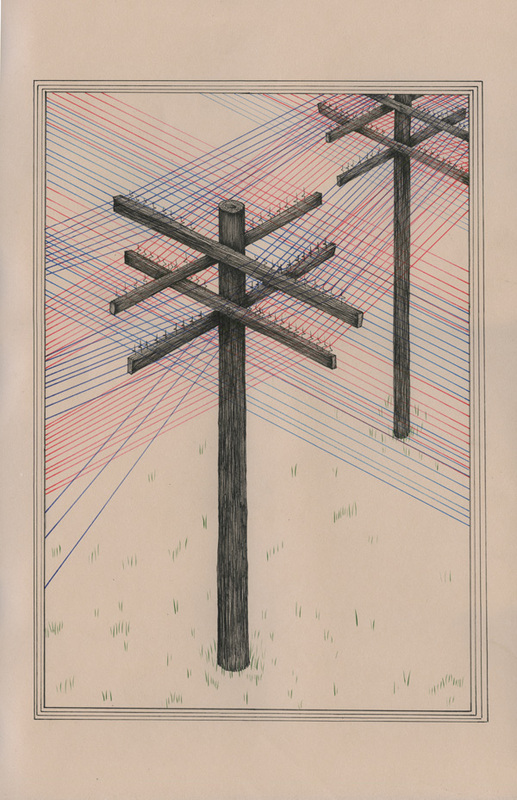 The resulting installation is an unlikely encounter between an old friend and a fresh voice. The works of the modern and the contemporary artist dance a pas de deux, with glancing touches and an occasional embrace. Most importantly, they integrate to form an intimate and rich installation that seeks to remind us why we keep coming back to the museum. In the end, I wanted this exhibition to enliven questions at the core of a contemporary museum that collects and exhibits modern art — to encourage our visitors to ask what it means to look, to seek, and to engage with the art of the past, and to bring those experiences into the present. John Zarobell was, until recently, assistant curator of collections, exhibitions, and commissions at SFMOMA; he is now an assistant professor and program chair of European studies at the University of San Francisco. Images in Dialogue is on view now through January 8, 2012, in the Djerassi gallery on the second floor. I remember seeing several rooms full of Paul Klee’s work in 2002 at SFMOMA’s A Passion For Paul Klee: The Djerassi Collection At SFMOMA. It was one of the best shows I’ve ever seen and it clearly illuminated the work of Anselm Kiefer, Joseph Beuys, Georg Baselitz and a lot of other contemporary artists. You are completely correct – he was much more influential than people realize. Had been French, who knows, maybe he would have been Matisse, he is that light and that retrained and that free.